Community Wellness is here to provide education and support to the community through support groups, programs and outreach. For a complete schedule of classes and events, please visit our calendar. This American Red Cross course prepares youth ages 11 to 14 for the responsibility of babysitting. Course cost is $25. This event is great fun for the whole family. Registration includes a T-shirt. The Cheeseburger in Caseville 5k Fun Run takes place during the Caseville festival in mid August of each year. Get certified in American Heart Association CPR with AED training ($25) or first aid ($25). Classes are offered monthly, or special classes may be scheduled for groups. 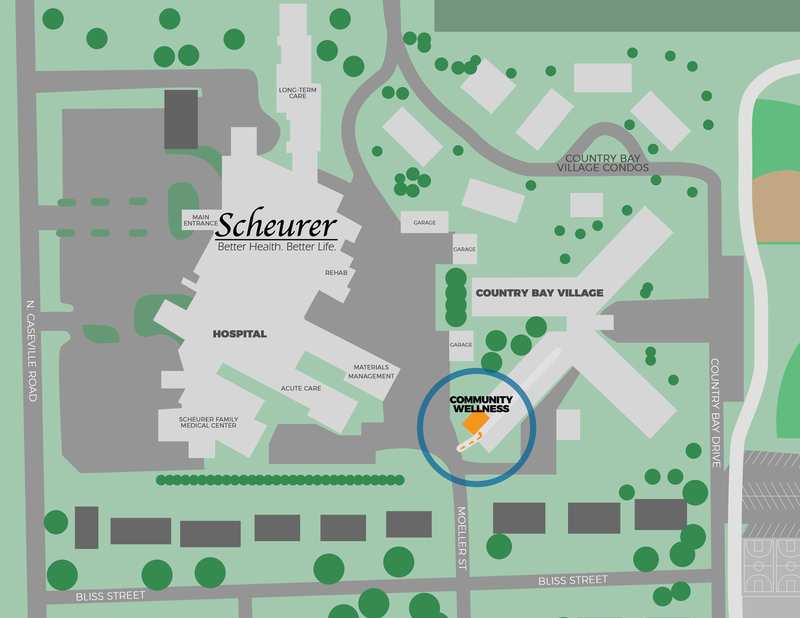 Scheurer is proud to be a day sponsor at the Huron Community Fair. From sunrise to sundown, we provide fairgoers with activities, food and fun! The Huron Community Fair takes place in late July/early August. This is a free event for the whole family at the Caseville Fire Hall. Bike helmets, make-your-own first aid kits and more! Kids' Safety Day takes place during the Cheeseburger in Caseville Festival every year in August. This race is a fun way for families to be active. Registration includes a T-shirt. The Sunset Classic 5k takes place every July. Join the Scheurer Hospital Relay for Life team. This family-friendly event is held at Bad Axe City Park. Come and visit that day, or join the team to raise money for the American Cancer Society. The Huron County Relay for Life event takes place in June of each year. Women of all ages are welcome to visit the tent at the Caseville County Park. Enjoy great health information, screenings and freebies. The Women's Health Expo takes place during Cheeseburger in Caseville in mid-August. Working in conjunction with local schools, Community Relations sponsors an after-school program to help kids learn about healthy lifestyles and food choices. Join this eight-week training program and work up to a mile-long walk. Participants receive a pedometer, a walking log and prizes. Scheurer Hospital will provide a speaker on a variety of medical topics for church or civic organizations. These are available free of charge on request. These tours introduce preschool and kindergarten students to the hospital and staff. Call to schedule a time that's convenient for your class. Lunchtime meals—made up of a main entree, vegetable, bread or roll, salad, dessert or fruit, and milk—are prepared by Scheurer Hospital's Nutritional Services staff. The staff takes great care to observe portion size, special diets and unique preferences. Dietary supplements are available at no additional cost. Meals are available Monday through Friday. Weekday holiday deliveries are also available. Customers can receive meals daily at lunch time Monday through Friday. Multiple meals may be delivered on one day so daily deliveries do not have to be made. Meals may be delivered only on selected days. Everyone is welcome to participate. There are no eligibility requirements for the Meals on Wheels Program. Customers are charged $3 per meal. Charges are billed on a monthly basis. If two individuals living in the same household request a meal, a 10 percent discount of the total monthly balance is given. To sign up for Meals on Wheels or for more information, please call 989.453.5262. These monthly educational programs are held in the Wilson Education Center at Scheurer Hospital. Join us and get your questions answered by the expert! A 12-week fitness challenge to help individuals (working in teams of six) to move toward their personal weight loss and physical activity goals. Kick-off starts Jan. 2nd. An eight-week program focused on strength training and toning. These programs are designed to celebrate growing older and provide helpful resources to older adults and their families. Held on Tuesdays in April at 2 p.m. at Country Bay Village. Third-graders learn brain and spinal cord injury prevention in this six-week school-based program. Participants receive a free bike helmet. This group provides support for those caring for loved ones. Meetings are held the second Thursday of each month at noon in the Wilson Education Center at Scheurer Hospital. Lunch is provided. Download the 2018 brochure. We are now located inside of Country Bay Village. Enter through the door nearest Moeller Street between the hospital and Country Bay Village. Community Wellness is the first door on your left. Click here for a map!